Air Con Christchurch provide and install wall or floor mounted heat pumps, and ducted central heating systems which can incorporate heat recovery ventilation to ensure a healthy, well ventilated home or office. Ducted central heating systems can remove the stale air from your home or office and introduce fresh air. Our experienced staff understand the region’s climate, and can suggest the best models of heatpumps and air conditioning for keeping Christchurch homes warm, cool, healthy and dry. 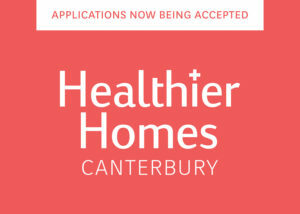 Canterbury homeowners can now get a $6000 rates advance from Environment Canterbury to pay for home heating, insulation and ventilation improvements. Air Con Christchurch is proud to be one of the registered suppliers to provide you with insulation, ventilation, and heating packages.